In northern Afghanistan, in the Bamyan Province there is a beautiful blue lake called Band-E-Amir. It is in Afghanistan’s first National Park and is completely frozen in the winter, under drifts of snow. After doing humanitarian aid work for nearly 2 years in Afghanistan I had the chance to drive several hours to visit the lake and enjoy the incredible surroundings. There was nothing to eat, but one family said they would cook us a basic kebab and naan bread lunch. Crisp , clear and well below freezing outside, we were very happy to come into the 2nd floor of a home just to the left of the walking entrance to reach the lake. 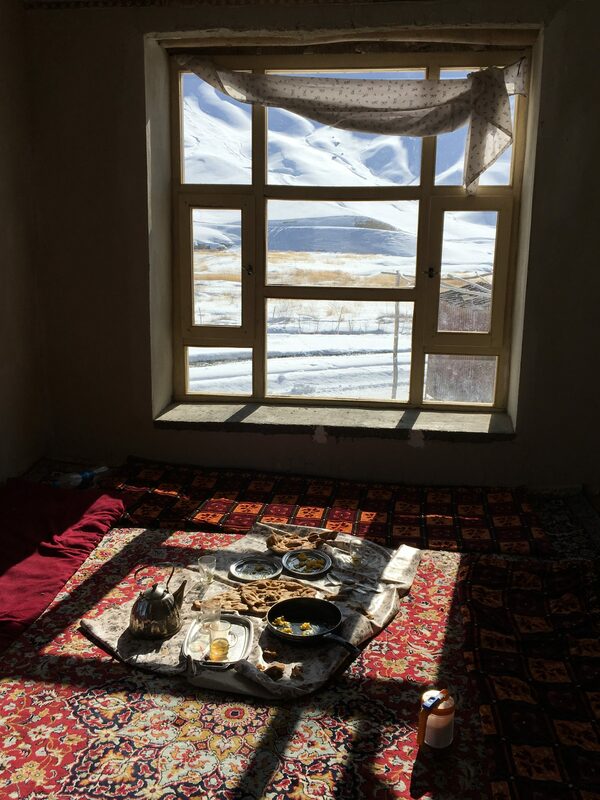 The large window allowed us to be bathed in warm sunshine during the simple meal. Northern Afghanistan, Bayman Province, Band-e-Amir lake in the winter. There is a small two story house to the left of the road where the walking entrance starts for the lake (not a lot of buildings near by). It was mid-February, I think around 14:00 in the afternoon. I thrive in new cultures. I do humanitarian aid work, enjoy most outdoor sports and activities and the chance to see a new place. I am a follower of Jesus. I have visited or lived/worked in nearly 30% of the world's countries, and do not intend to stop visiting new and challenging places. I use photography and journaling to filter the sights and sounds around me, but also to document my experiences to share and review later.